Dr Sumsun Naher has been elected to the Board of Directors of ESAFORM. 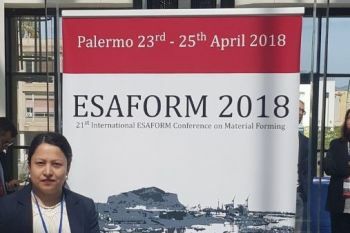 Senior Lecturer in Mechanical Engineering, Dr Sumsun Naher, has been elected to the Board of Directors of the European Scientific Association of Materials Forming (ESAFORM) during the International ESAFORM 2018 conference in Palermo, Italy. The conference was held at the University of Palermo from 23rd to 25th April. Dr Naher has been elected for a six-year term. She is one of only two new members elected out of 17 candidates vying for the Board position. The other elected Board member was Professor Markus Bambach, from Brandenburg University of Technology Cottbus, Germany. I am delighted to have been elected to the ESAFORM Board of Directors for six years. I have participated in it’s conferences for a decade, co-organising a semi-solid mini-symposium since 2008. I co-chaired the ESAFORM2017 Conference last year with Professor Dermot Brabazon from Dublin City University. This year there were 350 participants from 28 countries attending the conference. The Board of Directors meets twice a year to discuss different aspect of the development of the Association and I am looking forward to this new role. ESAFORM is a non-profit scientific association. It was founded in January 1997 to propagate an interest in all types of materials and all topics connected to Material Forming. The Association is run by a Board of Directors. The Association organises an annual International ESAFORM conference, and publishes the International Journal of Material Forming (impact factor 1.978) and a Q1 journal. ESAFORM's goal is the promotion of scientific information and applied research about the material forming process domain in university laboratories, public organisations and industrial companies. Professor Livan Fratini of the University of Palermo, Italy, is ESAFORM's President, and the Association’s Vice-President is Professor Ton Van den Boogaard of the University of Twente in The Netherlands.